Microsoft continues to add to the variety of Xbox One controllers on offer, and the next one will be the first in a new “Tech Series” of gamepads, the company announced today. 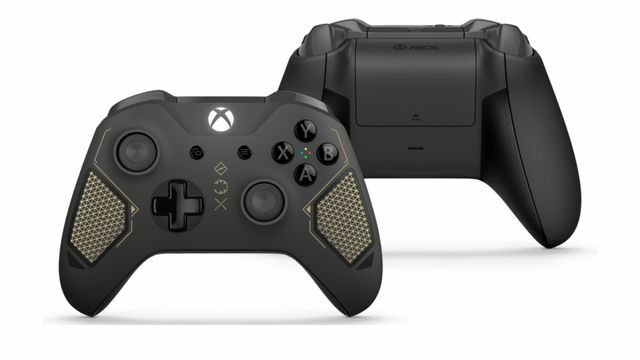 The controller, named the Recon Tech Special Edition, is inspired by “military technology and performance patterns,” according to Microsoft. The body of the controller is dark gray, with a matte finish and a laser-etched texture and gold-colored accents like military insignia. The horns of the controller feature a rubberized grip with a diamond pattern. This Tech Series gamepad is the latest design of the Xbox One wireless controller, a model that Microsoft debuted at E3 last year alongside the Xbox One S. This iteration includes Bluetooth support, allowing for wireless gaming on a PC without a USB dongle. The same applies to controllers from the Xbox Design Lab, which are customizable — although it’s not possible to reproduce all the details of the gamepads Microsoft sells, like thumbstick accents — and start at $79.99. Microsoft will release the Recon controller worldwide on April 25. The gamepad will cost $69.99, the same as all of the “special edition” Xbox One controllers.